CTET 2019 Online Application link reopened now. Steps to fill Online CTET Application Form Explained below. 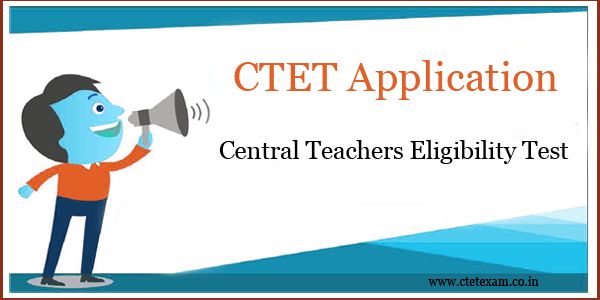 Central TET Registration steps provided involves information like personal details, education details, payment procedure, etc. Hence, interested candidates can check CTET Application procedure and apply for CTET 2019 till 12th March 2019. For more details like application fee, the process to apply, etc. you can go through the following sections of the page. CTET 2019 Application Form Last Date has been Extended to 12th March. Candidates can Make the fee payment Central TET Exam upto 15th March 2019 (5:30 PM). Central Board of Secondary Education, Delhi released CTET Notification 2019 on 4th February 2019. Dream of many B.Ed passed candidates come true with the release of CTET Notification. Candidates who are eagerly waiting for teachers jobs can apply Online for CTET 2019 exam. On our page, you can find steps to fill Central TET Online Application Form 2019. Central board of secondary education, Delhi issued CTET 2019 notification to fill the vacancies in teacher jobs in India. B.Ed passed students can apply online for Central Teachers Eligibility Test 2019 to get teacher jobs. CTET Exam 2019 Online Application form available on the official website that is www.ctet.nic.in Eligible candidates can check details of the CTET online application process. Aspirants must submit Central TET Online Applications before the last date to the CBSE Board. You can find CTET 2019 application fee details in the below table. For more information about CTET 2019 application form, read below details. CTET Online Application Corrections done between 14th to 20th March 2019. How to Apply Online for CTET Exam 2019? Before applying for CTET Exam 2019, the candidate should read instructions in TET notification. You can also follow below steps to fill application form. Online CTET Application Form 2019 involves four steps such as filling an application form, Upload images, Application fee payment, Print Confirmation page. You can choose three CTET exam centres in this row. Candidate can choose either Hindi or English as Question Paper Medium. Select status of the Qualifying exam, Employment status. Enter State, District, Name of the college/ institution, Pincode, and %marks appeared in Degree. Diploma % of marks, Name of the college/ institution, State, District, Pincode. Moreover, you need to enter further more information such as Educational Qualifications, College/ Institute Details, followed by Candidate’s Mailing Address. Finally, enter the Security Pin as shown in the page and submit the Application form. In the part-III, Upload the scanned images of recent Photograph and also scanned image of the signature. 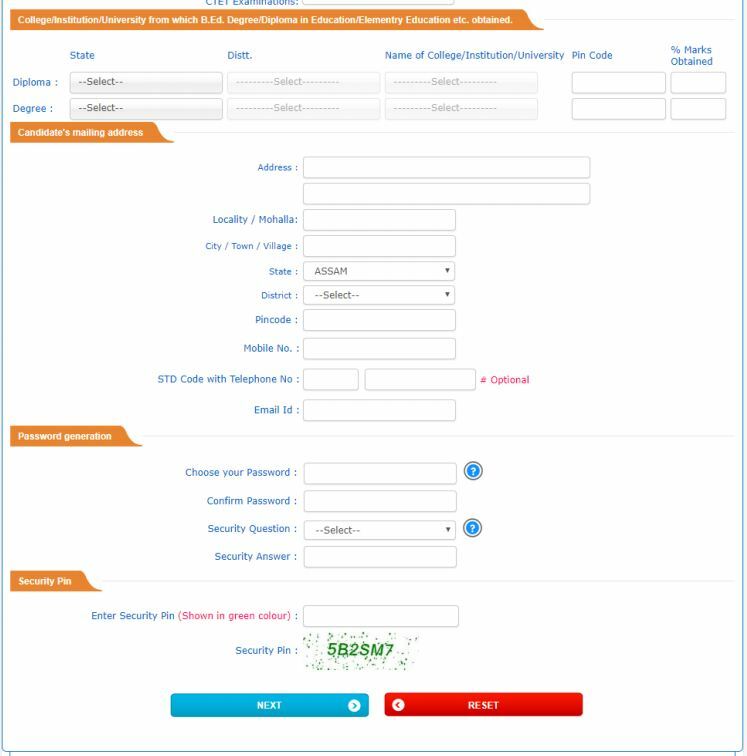 After uploading images in CTET Application Form, Click on the payment button below. Then the payment gateway page will appear on the screen. You can make payment through Debit/ Credit card or e-Challan. After successful completion of Payment, a confirmation page will appear on the screen. Take a printout or download the CTET confirmation page for future reference. Candidates who are appearing for CTET 2019 – Central Teachers Eligibility Test, can follow below steps while filling the application form. Hence, we have provided the Step by Step process of 2019 CTET Registration along with the online application link. 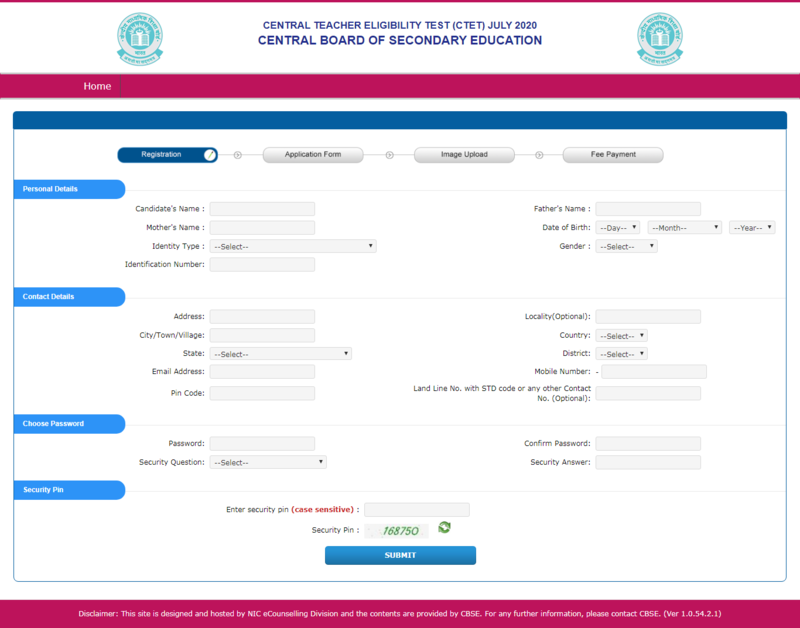 How to fill CTET Registration Form? Find ‘Apply online link’ and open the link. Read the instructions and click on proceed to apply online button. Upload scanned images of signature and latest photograph. Finally, take a printout of the CTET confirmation page for further reference. At first, after successful completion of CTET Application Form Submission candidates should check CTET 2019 Exam Pattern. Links to get Latest CTET Syllabus and Last 10 Years CTET Question Papers with Solutions PDF provided below. please let me know,when will application form will be issued for ctet exam 2017. Why given date submission of online application for CTET has been postponed? hmara, meghalaya,Sir will I be able to apply?and where will be my exam center? please help me. Hllo i want know for the test…….. Please postpone the ctet last date 2days, please forward this message to our friends please please please please please please. pls. send the link to fill application form. please could you tell me correct date of exam and when notification will be release. when is ctet exam 2017?i want to know the last date of form application? Is this way to wait of ctet exam.what is going on.parents are also very much disturbed. HI, deepti here actually my graduation is drop out! but i hve 2 yrs. diploma in E.C.E., so can i apply this ctet form. please let me know the next exam date and when to fill online application form for the same. Plz tell me kya B.ed wale , First ,and second dono form dal sakte hi????? Pls send me d link to fill up d form…..
is dere a perticular month of releasing form……??? When the date of exam will be announced. sir i am female candidate and my isc marks is 42% and ded final year student. sir say me i am eligible for CTET 2018. Let me know the CTET exam dates and opening of online registration for the same. CTET form fillup exam kabse Hoga….. Please tell me ctet notification now??? above mention is application form 2018 is available on official website but there is no option for online registration . Please share the application form filling date and link from where we can able to find the exact date . I just want to know when the registration will be start for CTET exam for 2018. Looking forward to get my answer shortly. Hello Deeksha, CTET Application dates not yet announced. Stay tuned for the Latest Updates on CTET 2018 Form submission dates. Unable to see online form… Wat to do….?????? Could you let me know the last date for application of 2018 CTET examinations? Waiting for answers. I just want to know when will the registration start for CTET exam 2018.
when will ctet come plz tell me.. Please tell me when will application from start? when will ctet exams form will be displayed? sir please inform. Please tell me about the notification of CTET. ctet ka form kis date ko aaega? ctet ka form kb aaega plz tell me ? just want to know when the registration will be start for CTET exam for 2018. Looking forward to get my answer shortly. please let me know,when will application form will be issued for ctet exam 2018 . Sir I am doing D.el.ed course it will be completed in March 2019. Can I fill forms of CTET 2018.I have 60 percent marks in 10+2. Sir I have 60 Percent marks in cbse 10 + 2 .I am doing d.el.ed course . Can I fill forms of CTET 2018 . I have complete 10 + 2 with Maths , Physics in 2010.Am I elligible for C.B.S.E CTET. When will CTET 2018 form will come ? Sir ! When will be the Application form of CTET release???????????? Plz let me knw when the registration will be start for ctet exam 2018. Tell me about exam form please….. When will CTET 2018 be conducted and from where can we fill up the form? Sir plz…so many aspirants r there waiting for ur reply & the exam….. Would u plz make us obliged by giving us the exact information about ctet exam ? We all r waiting for it with lots of hope & eager….So plz sir consider our prblm carefully & quickly….Hoping for the best from Central board…. When will be the ctet application form will be issued? I am graduate in B.Sc non – med ; and my B.ed is in yoga education . Am I eligible for CTET ? Please let ne know wen will the application form of CTET 2018 will be issued?? Diploma or d el ed are compulsory for ctet ?? Intermediate next can we apply for CTET EXAM. Plz reply me. I want to know that paper 1 & 2 exam will be same date or another date. I have completed my post graduate,am i eligible 4 ctet,Please inform me sir. Sir ctet online a play jab suru hoga???? Sir CTET-2018 mai hoga ya nahi . sir mere BA – 49.26%, MA-65%, B.ED – 64%, M.SC-RS/GIS – 70% hai ky m ctet apply kar sakta hu … BA-50% nahi hai …..
Sir i am from rajasthan and bsc final year student can i apply this form?? sir i am Bed Passed. MA 50% and BA 40% , i am eligible for CTET Exam. Can B.com students are eligible to give ctet exam ??? Kindly updates the date of online submission of CTET forms , pls confirm. when the site will open sir. when will open ctet online application site. When the website is open for online application, kindly inform . The last date you mention like 19th July with out the Opening day of online registration it means what sir. ? Kindly inform to us,.Just informing the starting day, how many days you need to take sir. Every day I am opening the site and searching whether the site is open for registration or not .Please do the best for our needs. I have completed MCA, Mphil, M.Tech, MBA(HR in DDE), B.Ed with 80% marks . I am happy to see the add. in news paper, But now while opening the site feeling so sad. Please,kindly inform us the starting day of registration. sir/madam please online ctet starting date……….. Please update the starting date of ctet online application. Please update the starting date of online application for ctet. sir when will the ctet onine applcation will start? Sr ab form apply ki date kb aaygi. There is no link provided to ‘APPLY ONLINE’ on official website.if any one have the link to apply online. kindly provide here. There is no ling to apply. How to apply? Please confirm the date for CTET application form . we are waiting eagerly . Sir please send starting date for applying online ctet form. I have to fill ctet form pls tell me when the ctet link was started . and the last date also coming soon. online application could not receive, please guide us..
What is meant for ctet application form last date for apply it 21july2018,is it in 2017sep. presently or July 2018? Kindly let me know about when online ctet registration and application form will start?when ever I open the site there is no link regarding Online Application.plz let me know. STILL THE ONLINE APPLICATION FOR CTET NOT REFLECTING. same issue with me , how I can fill up my form. I completed b. Ed.1st year but not result is came.can I apply ctet. Exam.pls reply immediately . when the online application registration will start. kindly reply me. when the CTET online application registration will start. kindly reply me. How to apply ctet form fill. Kuch show nhi ho rha . Plz tell last date form fill. How to fill ctet form. Plz tell last date form fill. when CTET application form start ?? kab khulaygi ctet online form? when application dates will be release??? When the ctet online application form fillup will start……………..??? Sir I passed B Ed degree from singhania university in 2015.sc catagory with age 44 years. Can apply ctet examination. sir when its open ctet online application ,applications available from which date? Please can somebody let me know when will the online application form be available. Sir when ctet applying will start? Plz inform. Can apply the all nios deled students .now we are appearing last year exm. special education selected by mistake so please tell me correction date …..
How long will this technical error last..? Y the web page is not loading. To apply. The first step also is not able to fill in. Even after keeping us wait for almost a month.. Its not fare to put us in truble again by not goving the proper link. Please look into it and solve it as soon as possible. I have completed my D. EL. ED. So can I chance give this exam?. Sir I have done B.Ed in 2015-2017 two year course but there is no any option of 2Year B.Ed in education qualification while we fill up the form…..so what option i will fill..
Hello sir i am trying fill CTET form from last 25 evening but unable to fill CTET form due to error –site is too busy. so please tell me or suggest what can we do. because 27th is last date. May last date will be extend or not. if not so what about site problems . give me reply as soon as possible . agar kisi ne ctet 2 nhi fill kiya h qa wo correction k time ctet 1 apply kr skta h? I am an obc sdtuden our inters mark is 48% .can I sitting ctet exam.. please reply. sir, today whole day server was down…. plz do something….